According to Rumorfix, talks between Richie Sambora and Jon Bon Jovi are going well. This is of course based on the assumption that Richie's absence from the tour is due to some kind of falling out, which hasn't actually been proven. Meanwhile, in this Portuguese interview, Jon reiterated that Richie has not been fired and there was no fight over money, which was a claim made by TMZ and has been one of many theories regurgitated since. 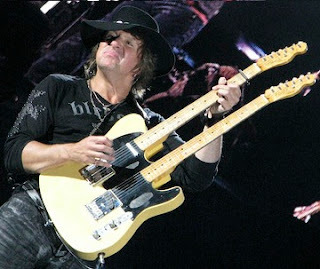 Richie withdrew from the tour ahead of the second leg for unexplained "personal reasons" and his absence was sudden enough that Bon Jovi performed in Calgary that night without a lead guitarist. Jon said Richie has not been fired and the two of them have not had a fight. Richie said he is great and everything is good, but he can't make any other comments. No one in the Bon Jovi camp seems to know if or when Richie will return. Bon Jovi fans, Jon fans and Richie fans have been losing their proverbial faeces. Based on his Instagram pics, Phil X could launch another career as a tourism ambassador for several European countries. Okay, so the last two points are my personal observations. But the irritating fact remains that despite all the drama, we barely know any more than we did at the beginning of April. Labels: interview, jon bon jovi, richie sambora, where's richie? Nice to see Bon Jovi starting to play songs from the What About Now album they're supposed to be promoting. Here's their set from Finland. Were you at the show? The first 40 minutes of the show were streamed live. Meanwhile, Phil X is now popular enough to have his own Twitter impersonator, although the fake Phil tweets predominantly in Portuguese and now has "PARODY ACCOUNT" in their bio after the real Phil objected to someone trying to be him. It was this low-blow comment from Jon to Richie that basically ended whatever relationship they DID have. Sources say that since Jon’s daughter’s overdose, Jon has gotten even angrier and more cruel to Richie. Richie has always maintained that his exit was for "private reasons" that he would not go into. We now know that this "private matter" was actually Jon's belittling. “Richie just went quietly and played for 20 plus shows that ended in late February, but when he had to return on April 2 for the next leg, Richie decided he wasn’t being paid enough to go through with all the cruelty from Jon,” adds the source. Personally, I think if Jon had actually said said that, Richie would have walked out there and then, not sit through the whole first leg of the tour stewing over it (and displaying remarkable acting skills). And why would Jon be suggesting the media ask Richie what happened, if he had said what Hollyscoop is claiming? Also, the first leg finished in March, not February. But this is just another thing to add to the melting pot of speculation. followed by a number, which I'm assuming is added because Twitter bars you from posting duplicate tweets from the same account. Apart from the #WeWantSamboraBack hashtag at the end, I'm not even sure what the tweet means. Then again, it's probably a fitting reflection of the chaos and confusion in Jovi Land right now. Labels: jon bon jovi, matt bongiovi, richie sambora, twitter, where's richie? Against the backdrop of the seemingly never-ending Richie Sambora saga, Bon Jovi played at the Stockholm Olympic Stadium. Were you at the show? It was good to see These Days finally make an appearance when Bon Jovi played in Munich on May 18, 2013. Here's a video featuring Always and These Days. Phil X later apologised for his solo on Twitter. @janie_piranha it was me. sorry... was the first time I played that song & blanked on the solo. it'll be closer to the record next time. Bon Jovi opened the encore with Dry County in Munich on May 18, 2013. This video was shot from further back in the stands but showcases the much-talked-about new stadium stage and production. Amidst all the off-stage drama, Bon Jovi had a concert to play in Norway and it looks like the pleas about changing up the set list are starting to get some positive answers. Were you at this show? If these articles are to be believed, Jon Bon Jovi is getting pretty frustrated with Richie Sambora to say the least. And possibly issuing ultimatums via the press, depending on how you read his words. Sipping water in his suite, 24 hours before a sell-out gig, Jon says: “We were all in Calgary, Richie was going to turn up on show day but we went the night before because it’s a long flight. “At 3.30pm on show day the phone rang and it was Paul the manager and he said guess what, and he didn’t even have to finish the sentence. I said, you’re kidding. We went on that night. I haven’t seen Richie since. “Love him, spoken to him once. I talked to him once, once in six weeks and 18 shows. He’s not fired, we didn’t have a fight, it certainly isn’t about money. Jon hinted that the reason may be the same as in 2011, when Sambora missed dates to go into rehab for alcohol abuse. He said: “It’s getting more and more difficult every day to not just sit here and say something... Because all I can say is this — it’s for personal reasons. He’s been through it before, fortunately for us the same guy who filled in last time was available this time. “Life goes on, so if someone chooses not to be here... unlike if this were, God forbid, The Edge, and he for some reason couldn’t make a U2 show, [then] it would be very difficult to just step in. Bon Jovi usually puts on a pretty good show for Munich and there were some welcome inclusions to the set for this concert. Were you there? Bon Jovi had a couple of days in between the allergy-aborted Sofia show and this concert in Vienna, although the break itself was not without drama... Were you at the show? Richie Sambora should stop tweeting about how great everything is and make some kind of statement. Or at least in some way acknowledge the fact that the band is on tour and he isn't. Yes, he is human and has the right to privacy and his "issues" are "personal". We don't need all the gory details. The question that really matters, that it appears only he can answer, is this: Is Richie returning to Bon Jovi or not? "To keep addressing the Richie thing, and it's very difficult for us because, in truth, it's almost to the point... you've gotta ask him. He didn't show up, that's all that happened. He didn't get fired, we didn't have a fight. We've been through this before. And when he works through his personal issues, then he can talk about what date, if at all, he chooses to come back. We love him, we miss him, it's different but it's still just as good, and we're fortunate that the guy that filled in for him last time that he had issues was available, so the shows have not suffered one bit." Jon Bon Jovi has firmly placed the ball in Richie Sambora's court in an interview on Cool FM. "Let's just say I certainly hope so. He has not been fired from the band, he is not ill, he's got some personal stuff that he's gotta deal with and I can't comment any further and it's not me being elusive, but it's for him to answer any further than that. We did not have a row, but we go on and he is always gonna be welcome as long as he's up for it." I don't know about you but that doesn't sound overly promising. :/ Here's the interview in full. Labels: because we can tour, interview, jon bon jovi, richie sambora, slane concert, where's richie? Jon Bon Jovi's voice hasn't been in the best shape lately but his hay fever/allergies killed it during this show in Bulgaria. After Bed of Roses, he was forced to skip chunks of songs; David Bryan had to sing In These Arms; and the concert ended after 20 songs with no encores. Jon apologised to the crowd before Wanted Dead or Alive. @joviholic31 it hit during the show. Tons of junk in the air their. You could actually see it in the lights. Things have been a bit heavy in Bon Jovi Land recently so here's something on the lighter side... This video of Will and Monifa Sims singing Livin' on a Prayer and the Eurythmics' Sweet Dreams while pumping petrol on The Tonight Show with Jay Leno has been doing the rounds. I challenge you to watch it without having a huge grin on your face. Perth was originally left off Bon Jovi's 2013 Australian tour dates, but the band will now be playing at Perth Arena on December 12. There was a December 8 date reported for Melbourne earlier, but this has apparently not been confirmed. Bon Jovi played in South Africa for the first time since 1995, sans Richie Sambora. Bon Jovi has announced their tour dates for Australia in December. As indicated earlier, my hometown of Perth is absent so I'll probably be doing a spot of travelling at the end of the year (I won't be going to every show or splashing out on an expensive package though). Will you be at these shows? The video for Bon Jovi's latest single What About Now has also been released. Due to a personal matter, Richie Sambora will not be performing on the European and South African leg of the tour. All shows will go on as scheduled. At least we know now, as opposed to the day of a concert like when the announcement was first made. But honestly, the longer this drags on the less "vague personal issues" is going to cut it. The ball seems to be firmly in Richie's court. We don't need a blow by blow of what's going on. If it's a health concern, say that. If it's family, say it's family. If it's a legal issue he can't comment on, say he can't comment at this stage for legal reasons. The whole saga has been poorly handled from a PR perspective. But more to the point, fans have supported the band for years and shelled out for tickets, travel and accommodation. They should get some idea of if/when the band's most recognisable commodity behind Jon Bon Jovi himself is returning. Richie being out for South Africa and Europe takes us all the way to early July -- that's three months off the tour with no explanation. And it's getting to a point where we can't dismiss the possibility that Bon Jovi will just continue to make meaningless statements like the one above ahead of each leg for the rest of the tour... maybe even culminating in an announcement that Richie Sambora is leaving the band "due to a personal matter". Will you still go see the band without Richie? Labels: because we can tour, matt bongiovi, richie sambora, where's richie?